Norfolk, Virginia: What is Six Sigma Training and Certification? Norfolk, VA: What is Six Sigma Certification? Global SixSigma offers several training options in the Norfolk area, including understanding of ‘what is six sigma.’ In addition to Yellow Belt, Green Belt and Lean programs, we also provide our popular four week Black Belt option in Norfolk and what is six sigma principles. The four week Black Belt includes two weeks of our Green Belt program and two additional weeks selected from our Black Belt after Green Belt. Students registering for all four weeks at the same time will get a discounted rate of $6500. The four week Black Belt also allows individuals from the same company to pursue Green and Black Belt certifications together, which promotes synergy and flexibility. In addition, we offer a number of onsite options, including our Six Sigma Champion course which is perfect for companies just beginning the implementation process to further understand the ‘what is six sigma’ mind set. The newly renovated lobby at the Courtyard by Marriott Norfolk Downtown, VA provides greater flexibility for guests traveling to Norfolk, Portsmouth, and Virginia Beach. 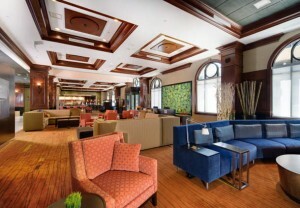 This Norfolk hotel near MacArthur Center Mall features a new lobby with inviting spaces, free Wi-Fi and access to the latest news, weather and local information via our GoBoard. The highlight of our new lobby is The Bistro-Eat. Drink. Connect., which provides guests with healthy food, beverages, and Starbucks(R) items during the day and evening dinner service with cocktails. Guests will be near the NorVA, Chrysler Hall, and Granby Street, known for an eclectic mix of shopping, dining, and entertainment. Business travelers will be near Dominion Enterprises, Norfolk Southern, Sentara Norfolk, and Old Dominion University. We offer a fitness center, indoor pool, whirlpool, 24-hour business center and boarding pass printing service to make your travel easier. Mention 6 Sigma when making your reservation to receive the discounted sleeping room price!